After 94 years of history, the Stonehaven Cup and the many youth programs that were run for all those years, preparing kids to participate in the regatta, number in the thousands. Fond memories of the Australian 12 Foot Cadet dinghy and the shenanigans that the participants got up to during these events are legendary and form the fabric of the lives of so many sailors today. You can go to just about any bar in any sailing club in Australia and you will meet a race officer, a club official or a volunteer who was a ‘Cadet Kid’. So many of today’s sailors started their lifelong association with our sport through the ‘Cadets’ – many famous names in sailing and 100’s more who just started for the fun of it and are still at it. It is well known that Stonehaven Cup is the longest continuously contested junior one-design dinghy trophy in Australian yachting. In January 2019, Royal Brighton Yacht Club hosted the 90th edition of the Stonehaven Cup Regatta. 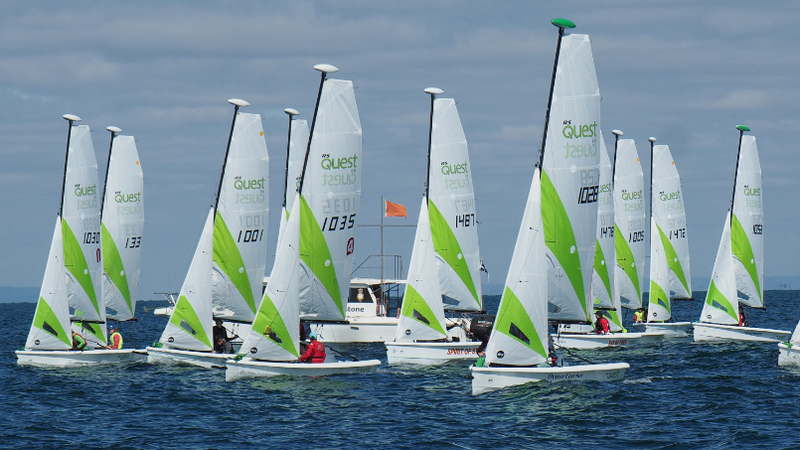 Much to the dismay of all the ‘old Cadet boys and girls’ this was the first time the competition was conducted using the new RS Quest dinghies, a historic occasion for both the Stonehaven Cup competition and RBYC – the trustees of the Stonehaven Cup. True to its historical context, the Stonehaven Cup is still a friendly competition for boys and girls under the age of 19 years who represent their respective participating clubs. A key to the success and relevance of the event is that it involves 3-crew sailing and this has been written into the NoR for the new RS Quest dinghies. The Youth Challenge Program as it is managed at RBYC is aimed at teenagers of secondary school age between 12 and 18 years old. The focus of the program is sail training, racing, having adventures and making friends. The program aims for an equal spread of boys and girls and takes them at any skill level. The only pre-requisite is their desire to have fun with new friends and embrace the program. Beginners typically go racing from day one on club owned boats to help keep costs down for participants and their families. The three or four person platform with three sails (main, jib and spinnaker) allows participants to progress through the roles on the boat as their skills develop. The pathway in is as a beginner, an experienced teenager or as an experienced junior. The pathway out is to youth performance sailing, senior off-the-beach, one design or keel boat sailing. The three crew training model is a very cost effective way for clubs to implement a sail training program for sailors of any age. In moving from the much loved 12 Foot Cadet Dinghy to the RS Quest for the youth training program and subsequently the Stonehaven Cup competition last season, the review committee looked at the key boat selection criteria, namely – three or four young crew, seaworthy, easily handled, easily maintained, one design and produced world-wide. A disciplined approach was applied that gave RBYC the best result for their needs and the needs of the other clubs with a big investment in the 12 Foot Cadet Dinghy. The process for selection of the RS Quest followed a rational, transparent, auditable process. It is a curious fact that when this review process was started, the RS Quest didn’t even exist as an option. The RS Quest provides all of the opportunities that the 12 Foot Cadet provided but with a contemporary look, a modern sail plan and moderate performance. Over 70 RS Quests have been sold around Australia since their release just 18 months ago, with nearly all acquired by clubs for training purposes. A sign of the success of sales of these boats, RBYC’s first boat had hull number #133, and 18 months later, its most recent acquisition has hull #1472. An Open Division was run during the event with the primary objective being to provide opportunities for less experienced young people to be introduced to the Stonehaven Cup competition and community under the guidance of experienced adults. That said, there are no age restrictions for the Open Division and crew size may be 3 or 4 to accommodate a wide range of crew configurations. The RS Quest can comfortably carry up to three adults, so we had crews of one or two adults who have aged out of the youth event with one or two young people new to our sport. The 90th Stonehaven Cup saw young sailors from Royal Brighton Yacht Club, King Island Boat Club, Royal Melbourne Yacht Squadron, St Helens Sailing Squadron enjoy a fun week of sailing, re-acquainting with old friends and making new ones. After a wonderful series with a range of weather conditions and extreme heat, the crew of Eliza Ewart, Lallie Leckey and Grace Phillips won the Stonehaven Cup in convincing fashion with a string of first places. Their joy at winning such a famous regatta was clear to see as they are just the second all girl crew in the 90 year history of the event to get their name on this most famous cup. The Youth Challenge Program and the Stonehaven Cup regatta is the chance for teenagers of all abilities to have fun, make new friends and write some of their own history. The adventure that is the Stonehaven Cup. How much fun can so many kids have sailing such a fabulous little boat?